President Trump is going to release a "gag rule" any day now. This rule is designed to block people from getting accurate information about their health care, and would prevent doctors from giving patients the vital reproductive health care they need. If the gag rule takes effect, patients won't be able to get birth control and preventive care at Planned Parenthood health centers. At the same time, it would also require doctors and nurses across the country to withhold information from their patients. Now more than ever, we need to get loud. 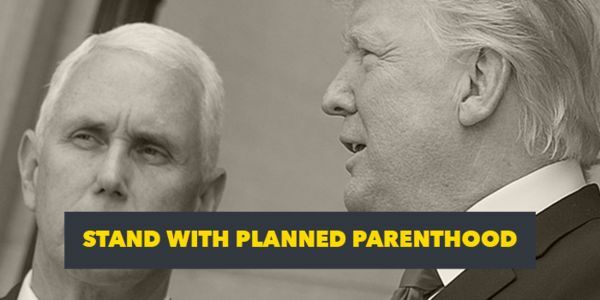 Sign the petition to tell the Trump administration that you're ready to fight like hell to protect reproductive health and rights in this country. Tell them you stand with Planned Parenthood. Subject: I Stand with Planned Parenthood. Trump&apos;s "gag rule", which will be released any day now, will prohibit ANY Title X health care provider, from referring patients for abortion. It will put the access to care and information at risk for the four million people who depend on Title X at risk. I will not stand silently by as our reproductive health and rights are attacked. I am one of the overwhelming majority of Americans who stands with Planned Parenthood, and I strongly oppose these attacks on our reproductive health and rights, now and always. I stand with Planned Parenthood. I fight with Planned Parenthood. I will support those who stand with Planned Parenthood.